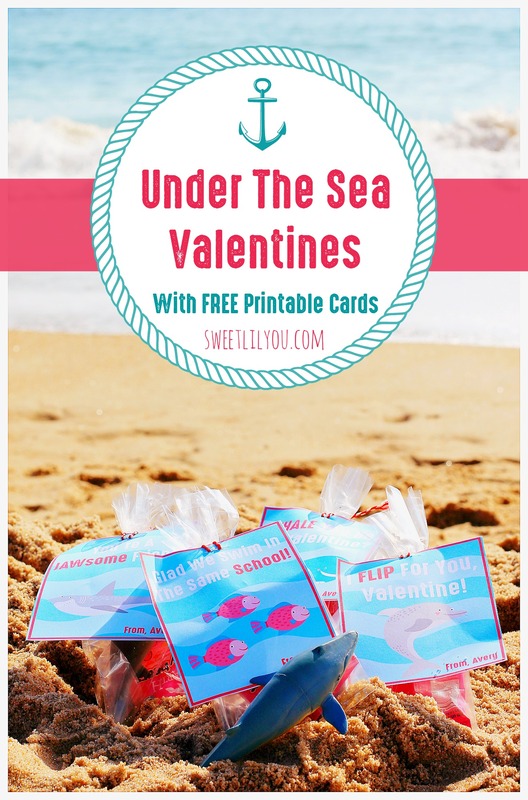 Is your child totally into sea creatures? 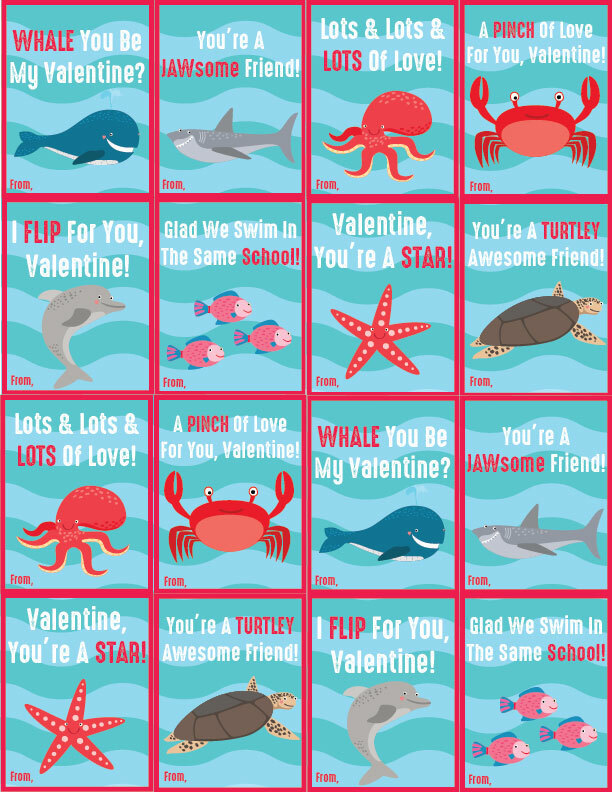 They will love sharing these printable Under the sea valentines with their friends! Valentine’s Day is coming up, and it is time to get to work on our cards!! This year, I had promised myself that I’d just BUY cards. I wasn’t going to make our own. Well…as you can see here, that didn’t happen. 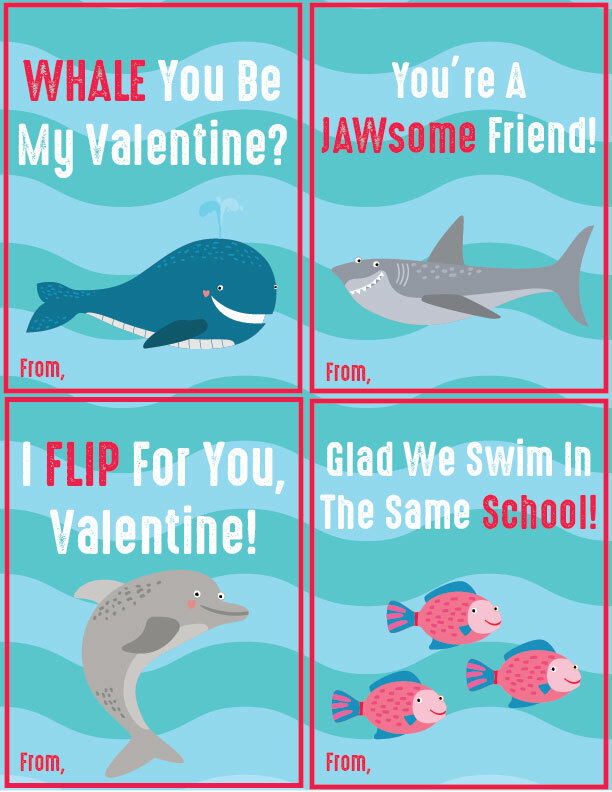 Avery goes to school at a local aquarium, and we thought it would be fun to hand out ocean themed valentines! Well, we looked, and looked, and looked. The shelves were stocked with cats and dogs, baby animals, even bugs, but not a single fish or whale or shark to be found. So, I got to work!! 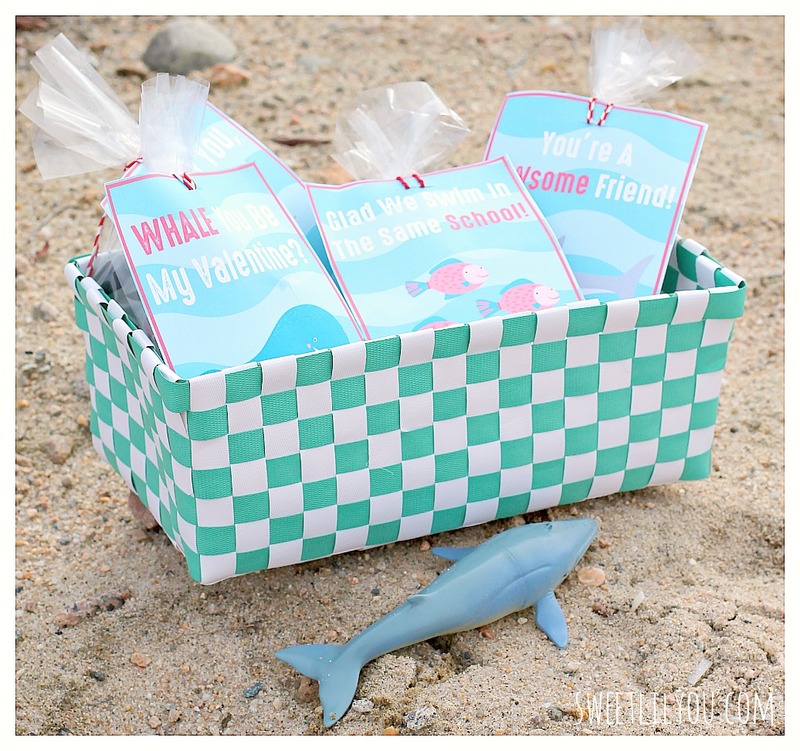 While shopping, I found some Sea Life toys on super clearance, and grabbed them to include in little goody bags! Then went home and got to work. 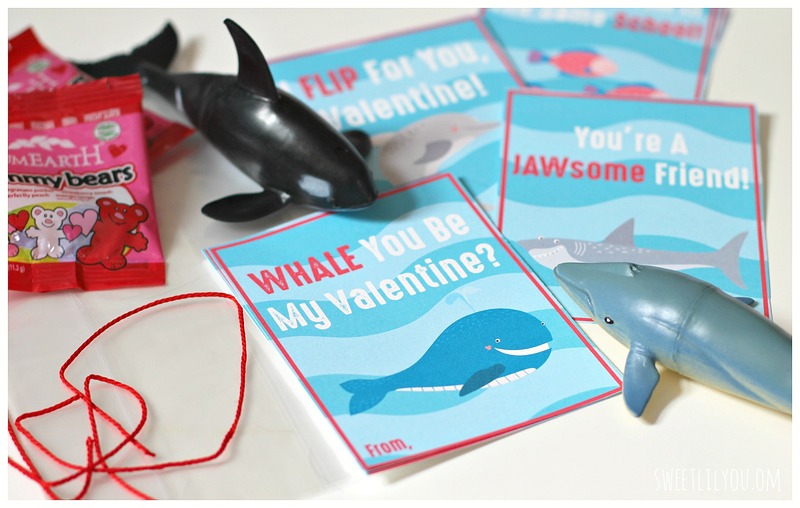 I designed some simple but cute cards to go with the toys and then put the goody bags together! I don’t think I need to give you a detailed tutorial on how to fill treat bags…but…Put everything in the treat bags, cut or punch a hole in the stop of the card, loop your string through, and tie the bag closed. Ta-Da!!! It took less than half an hour to put these together for Avery’s class of 15, and I’m feeling pretty good being ahead of the game (I’m usually working on this stuff the night before!!) Want to print your own?? Click the links below! Whale – Shark – Dolphin – Fish – Download & Print here! 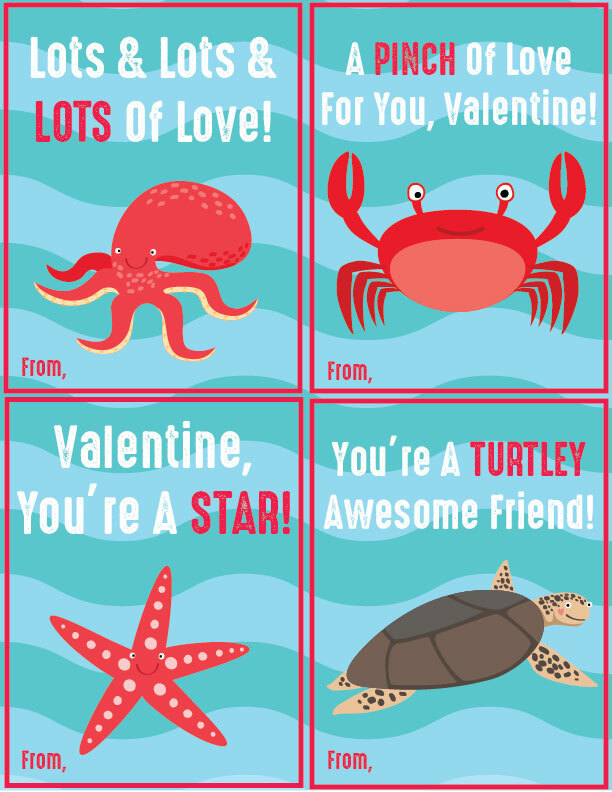 Octopus – Crab – Starfish – Turtle -Download & Print here! Mini Cards – Download & Print here! So what do you think? 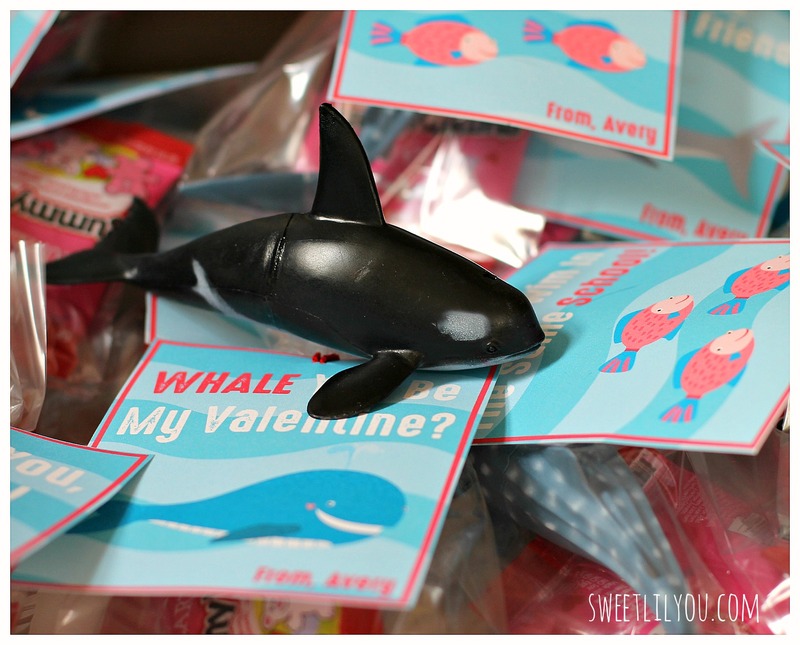 What kind of Valentines will your kiddos be handing out? 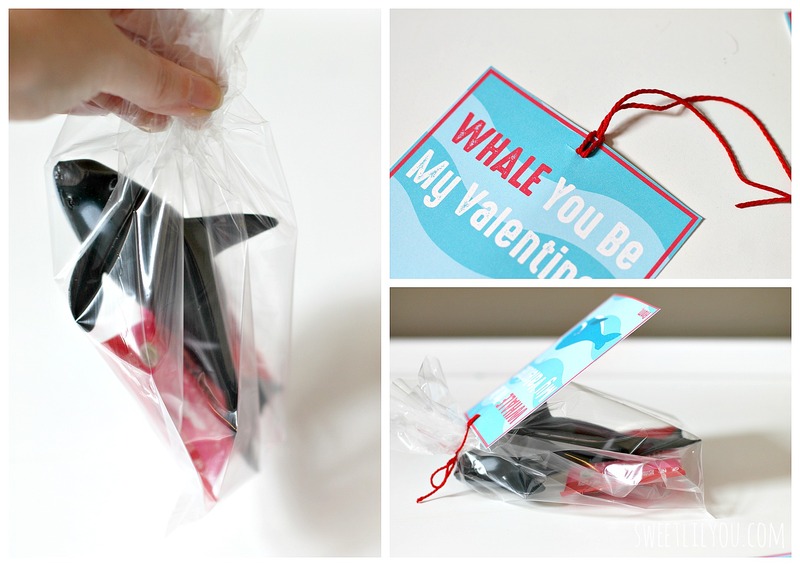 This entry was posted in DIY and tagged aquarium, crafts, DIY, ocean, printable, school, valentine. Great job , i think they are adorable! Sarah, these are absolutely adorable! I can’t imagine you even considering buying something like this. You’re way, way, way too creative, and so are these. I’m sure they’ll be a great hit! I love these SO much and a printing these today! My daughters preschool asks us not to hand out candy so this perfect!! Thank you, these are perfectly adorable. These are wonderful! I love them. We will be printing these and sharing your post! Thanks so much! Hey,What a great idea! I have been wanting to do something similar this year, so I’m happy to have found a great list of ideas! Well that is pretty cool and best collection for the children to learn and start with. Thank you so much for providing this free as the children at school absolutely loved it. I think I’ll use them for my son’s classroom. Thanks for sharing. Well this is great infomation. These are wonderful! I love them. I just share your post to my social personal account! Thanks so much!